Hi everyone! I am so excited to be here today to share the new Essentials By Ellen Winter 2016 Release. As you may or may not know, this is one of my favorite lines. And there is a heap of new stamps and dies available now over at EllenHutson.com. Be sure to check them out. I've created several projects for you today. In addition, there is a giveaway and a brand new video tutorial for you to check out! Let's get started. 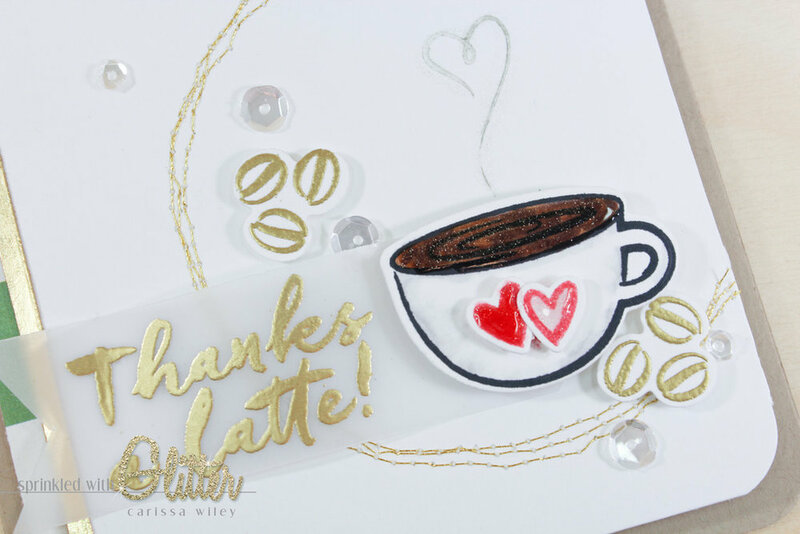 My favorite project by far is the projects I created using the new Many Thanks die cut. This is Julie's writing (and I adore it). You've probably seen me use other dies with her writing in the past. They quickly become some of my favorites. For this die cut, I decided to create and ombre effect using some Copic markers. Then I added some Rose Gold foil along the bottom to give it a dipped effect. I wish I could capture this effect better in photos...but it is so hard to photograph foil and show its true beauty. I created two versions of this card. The first version also features the new Bitty Envelope dies. These adorable little envelopes are so much fun. I cut them from a mixture of white and Pale Rose card stock and mounted them around the sentiment. I love that the die creates the embossed line on the envelopes. And I also love that the Bitty Envelopes come in different "card sizes". I stamped a tiny heart on them (which is from the new Oh Frappe stamp set) in some Gumball ink from Ranger. It's a fun touch. For a more simplified version, I left the envelopes off the second version. I changed up the base card stock layer. I love how the woodgrain card stock repeats the woodgrain element that's stamped on to the ink background on the card front. The subtle texture adds so much to a simple card. I'll show you both of these cards in the video tutorial below. Be sure to check it out. 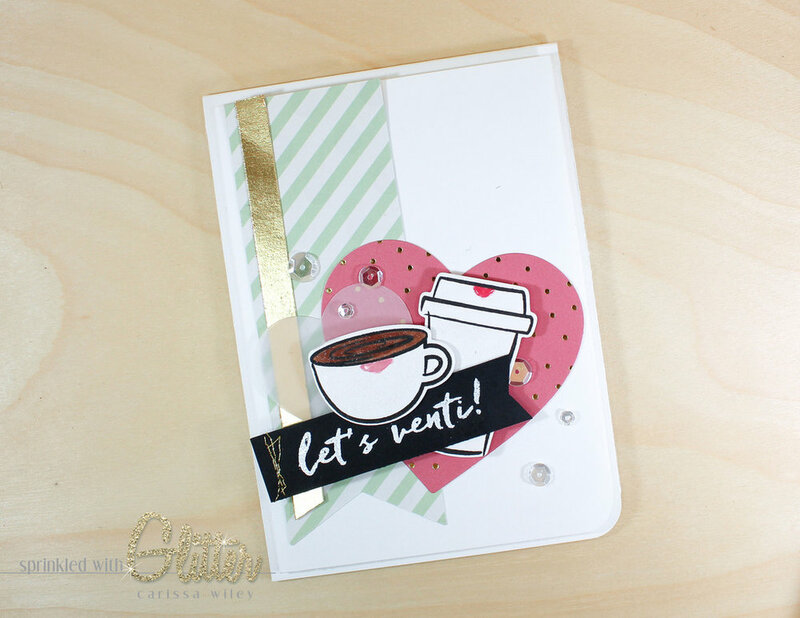 The next several cards feature the Oh Frappe stamp set and coordinating dies. I had a great time creating with this set. I love the sketchy feel of the coffee cups in this set. And the brush stroke sentiments are so much fun! This first card may be my favorite of the coffee cards. I love the simplicity of it. But I couldn't resist adding my own little touch to the sentiment. If you know me at all, my usual drink at "that coffee place" is a Skinny Vanilla Latte. So I thought I would add that to the "thanks a latte" sentiment. I just used my Dymo label maker to add these words. You could also print them out on your computer. I wanted to add another personal touch to this card...so I added lipstick to the cup. It's not often that you'll find one of my coffee cups without a lipstick stain on it. I just dabbed some red pigment ink on to the cup and then coated it with some glossy accents to make it shine. ;) I also added more shine to the card with some Pretty Pink Posh Sparkling Clear sequins. I used the Oh Frappe stamp set again to create this second card. I decided to take a little bit different track with this one. I wanted to combine the adorable cups with some fun patterned paper and die cut elements. I used both the espresso cup and the "to go" cup for this card. And since I know this card will likely go to a friend, I decided to put lipstick on both of the cups. One last card for this release. It's simple and easy. I knew I wanted to use some green to elude to my favorite coffee joint. So I brought that in with the patterned paper along the side. To keep the adorable cup the focal point, I added a simple gold stitched circle around the cup. I also mounted to cup with foam adhesive to add dimension. There you have it! Lots of inspiration for you featuring the new release from Ellen Hutson. I hope you've enjoyed these projects. You'll find even more inspiration along the hop. I'm bringing up the tail end of this hop, so from here you'll head back to the beginning of the hop over at The CLASSroom blog. And if you get lost, there's a complete list of designers over at The CLASSroom blog as well. I also get to give away an Essentials by Ellen stamp set! The winner may chose ANY Essentials by Ellen brand stamp set (maximum value $15) currently in stock at Ellen Hutson.com. To enter my giveaway, please leave a comment on this post by February 16th! There is also a crazy awesome Grand Giveaway in the CLASSroom! To enter, be sure to leave a comment THERE, also by February 16th; ALL winners will posted at the CLASSroom on Friday, February 19th! Thanks for stopping by today! I'm so glad you've joined me. And I really hope you've enjoyed all of the fabulous inspiration along this hop. Don't forget to check out my video tutorial below. I've also linked all the supplies used in these projects below. Crop-a-Dile Corner Chomper Tool, 1/8" & 3/8"